Here’s an easy card for you! 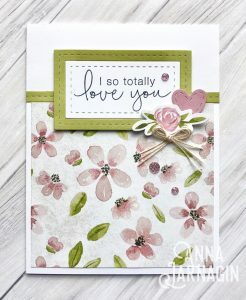 I used the Close to My Heart April Stamp of the Month: Love So Sweet, for the cute sentiment. I like the font and sentiments so much…readable yet scripty too! And this is one of my favorite card patterns in CTMH’s Vol. 4 pattern book. Only one cut (4″ x 4″) plus the card base and your personal touch embellishing. Voila! You can get the SOTM for $5. (reg.price: $18.95) with $50. purchase. Great savings! Check out the Close to My Heart How-To Card Pattern book, Volume 4!